This summer is bringing record heat to many parts of the US. It is easy for us to realize when we are too hot, but sometimes it can be difficult to tell if our pets are too hot. Remember that your pets do not sweat and they are wearing a fur coat. Panting is the only way that a dog or cat can cool down in hot weather. If you live somewhere that has humidity combined with the heat, your pet will have a tougher time cooling down. I have 2 Labs at home. Well, one Lab and one Lab mixed with a mountain goat or antelope or some such vertically jumping creature!! They are a constant source of entertainment. Sophie, the Lab/antelope mix, has this great thing she does when I get in bed at night. I will get in and she will stare at me for about, oh I don't know, 2 seconds or so. And then....she launches herself straight up in the air like she is on a pogo stick and lands right on top of me! Thank goodness that the antelope she is mixed with was small because she only weighs about 50 pounds whereas the other Lab that lives in the house weighs 95. I think most people are in favor of spaying or neutering their puppies and kittens. There is not much controversy among the lay public nor the medical community. There are many reasons to spay and neuter our pets: population control, behavioral issues, and medical advantages, to name a few. The discussion changes a bit when we talk about adult dogs and cats, especially those approaching and in their older years. The Labrador Retriever was again the #1 dog in the United States as far as the number of households owning this particular breed. Labs were followed by German Shepherds in the #2 spot. Golden Retrievers slipped to number 4 behind the Yorkshire Terrier. Interestingly, 3 of the top 4 dog breeds are breeds that are plagued by orthopedic ailments. Maybe this is part of the reason that there is such a plentiful variety of supplements that are meant to alleviate the pain associated with arthritis. Have you seen Time magazine's What Animals Think Cover? Gracing the cover of the August 16, 2010 edition of TIME magazine is a graying Pug, saying "Way to go, Einstein." The article that goes along with this cover is titled Inside the Minds of Animals and begins with the author's visit to "Kanzi", a bonobo (close relative of the chimpanzee) who has a vocabulary of at least 384 words. Kanzi communicates through icons or symbols and creates combinations of known symbols for new experiences. One example that was given in the article was slow + lettuce for kale, a green that takes longer to chew than lettuce. While most of us have heard about the communication abilities of primates, this article looks at other species and questions the superiority of humans when it comes to brain size. 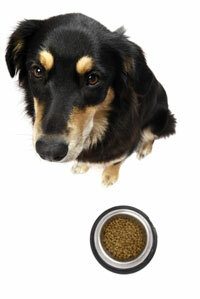 Recently, several pet foods and treats have been recalled because of the risk of Salmonella contamination. While this may seem like a reason to sound the alarm and leave the food on the shelf, it is important to really understand the situation at hand. Many of the recalls have been precautionary, meaning that Salmonella was detected on a screening test but illnesses were not reported in association with the particular food or treat. I am going to believe the studies that say that laughing helps keep you healthier and living longer. I am also going to believe the studies that say that pets help lower our blood pressure and relieve our stress (I am seriously questioning this when I am cleaning up something that one of the 5 animals in the house has thrown up in the middle of the white bath mat, but I am going to believe it!). Continue to protect your pets from mosquitoes! While the weather is still warm, it is important to protect your pets from nuisance pests. I heard an interesting story on the radio about mosquitoes yesterday. The discussion was about the ability of pests to survive the long, cold winter. Mosquitoes have a sort of hibernation that they do every winter. Only the females survive and they do so by increasing the fat in their bodies 10-fold before the cold weather hits.Yes, fat mosquitoes! Protect your pets from the heartworm transmitting mosquito. Talk to your vet about the monthly heartworm preventive for your dogs and cats. Most vets recommend a heartworm test to ensure that your special pet does not have this awful parasite before you begin the preventive. 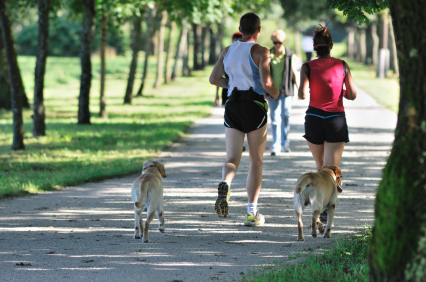 Ready to Hit the Trails with Fido? Make sure to properly prepare to make the experience good for everyone. I am a runner and currently in training for a half marathon. I love to run with my dogs. My dogs love to run with me. Well, maybe not so much. I have one dog, a lab mix named Sophie, who could probably compete in an Ironman (if she could ride a bike) and be ready to go again after a 30 minute nap. Ok, maybe I exaggerate a bit, but she is a ball of energy and can run circles around me. My big Lab Hank loves to go for a run, but is better at a slow pace than my relatively quick training pace. And the old Frog Beagle runs about 10 feet and she's done. She stays home and joins us for the cool down walk to the corner after the run.